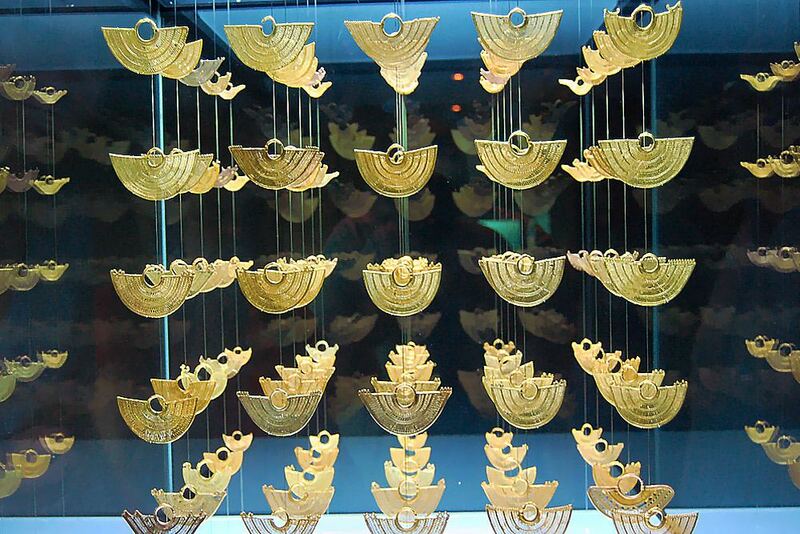 The Gold Museum, or Museo Del Oro, is a huge part of the tourism industry in Bogota, Colombia, and for good reason. In fact, it receives around half of a million guests per year, so based on these numbers alone you know it’s a good place to try to visit when you are in the Bogota area. There is a huge collection of Pre-Colombian archaeological treasure here which includes art, jewelry, medallions, currency, and more. The Bank of Republic started this collection in 1934 in order to protect the archaeological treasures of the area. It was recently renovated in 2008, and they made it completely mesmerizing for all of the visitors who walk through the door. The object called “Popora Quimbaya” was the very first exhibit, and it has been on exhibition for over 70 years since. It shows appreciation for the ancestors who lived in the many different societies before the Spanish conquest occurred. The entire museum is very elegant in nature, which only makes sense given that it is showcasing one of the Earths most precious natural and sought after materials. There are four different floors for visitors to explore, and they accommodate both Spanish and English speakers. There are also audio guides that are available in different languages as well as personal guided tours so that everybody can enjoy the knowledge and information presented at Museo Del Oro. The second floor features the “Working of Metals” gallery goes over the mining and manufacturing aspect of ancient gold. It also houses the “People and Gold in pre-Hispanic Colombia” gallery that talks about how these precious metals were used politically and religiously. The third floor houses the “Cosmology and Symbolism” gallery, exploring the mythical and religious symbolism. It also features the “Offering” section of the museum that shows more about offering ceremonies. The “Exploratorium” on the fourth floor encourages guest to be interactive and also reflects on the different meaning of heritage that are present throughout the museum. There are extremely old artifacts here which makes it a great experience for anybody who has an interest in history and the stories that go along with it. There are artifacts from the Quimbaya, Calima, Tayrona, Tolima, Tumaco, Malagana, Sinu, and Muisca cultures. You can find golden artifacts such as breastplates, masks, brooches, bracelets, rings, and necklaces. The dark rooms with bright lights show off the distinct qualities of gold that has made it an unforgettable material through out the centuries. In fact, there are nearly 13,000 gold artifacts and 20,000 other interesting stone and clay artifacts to observe here. The Museum of Gold is located in the center of the city. To get there, consider taking a Transmilenio bus towards Las Aguas, and alight at the specific Museo del Oro station. If you plan on driving yourself, it is most advantageous for you to arrive along Fifth Avenue from the northern direction. The museum offers free parking for up to two hours for vehicles, but that parking is known to run out pretty quickly due to the popularity of the attraction. They have temporarily banned parking bicycles at the museum, so be sure to think of this if you planned on traveling by bicycle for convenience. It’s also very easy to reach by foot through Seventh Avenue, Bogota’s main pedestrian thoroughfare. From Tuesday to Saturday and on national holidays, it costs 4,000 COP to get into the museum. Admission is free for all on Sundays, which is also one of the most popular days to view the museum. Free admission continues for children under 12 and seniors over the age of 60. It is also free for school groups who have made a reservation, indigenous groups, members of the army and police, and those who have subscribed to the Banco de la Republica Art Collections Foundation and Libraries Network. Another free day is May 18 which is International Museum Day, and the national holiday on July 20. To get a ticket, head to the ticket office at the entrance, even on free admission days. Only Colombian pesos are accepted here, and they can’t be purchased in advance at all. As we’ve stated before, Sunday is the most popular day at the museum due to free admission, and there are a lot of crowds. If you want to avoid the chaos of crowds, be sure to check it out on a day other than Sunday such as a weekday morning. The museum offers guided tours which is included in the ticket price! They are offered from Tuesday to Friday (In Spanish 11AM, 3PM,4PM. In English 11AM and 4PM) and Saturday (In Spanish 10AM, 11AM, 3PM, 4PM. In English 11AM and 4PM). Be sure to pick up a booklet to go along with your tour so you don’t miss out on any of the important details. The museum is closed on Mondays, for elections, and Good Friday. There is free Wi-Fi in the museum, and you can get more information on how to connect to the network by heading to the Information Point found on the first floor. The bathroom is hit or miss when it comes to cleanliness, so try to use the bathroom before you start your adventure here. It can take up to 2 hours to view the whole museum, though, so it might be unavoidable to use the bathroom here if you are going to the cafe beforehand. There is also a cafe in the museum as well as a gift shop, so it’s wise to consider bringing cash for your ticket and these activities if you want to get the full experience. The cafe has delicious Colombian foods, coffee, and pastries to munch on before or after you check out the rest of the museum. For more information on the museum or if you have any questions, you can contact them at (571) 343-2222. Many of the wonderful things our beautiful, historic city offers have existed for thousands of years. Being the 5th largest city in the Americas, there is always new and exciting to experience. Renting Colombia based luxury apartments has never been easier! One look at our Bogota short term rentals will end the debate about where to stay in Bogota, Colombia, no matter long you are looking to stay we are ready for your arrival. You will find yourself feeling much safer and at home than if you rent out someone's house or stay at a hotel. Our newest modern furnished apartments are perfect for everyone. Work, play, or a mix of both!